There is not a shred of evidence that the fortunes of classical music are linked to what audiences wear, or don't wear. But the subject of dressing down versus dressing up continues to exercise the minds of classical music's movers and shakers. However, there is clear evidence that the sound audiences hear is vitally important. Yet, despite this, there is very little interest in the possibility that reshaping the sound may be the key to reshaping the future of classical music. In his influential book The Tuning of the World, composer and acoustic ecologist R. Murray Schafer coined the word 'schizophonia' to describe the disparity between an original sound and its electroacoustic reproduction. Schizophonia* is a form of cognitive dissonance, a condition that creates unease in a person. The Tuning of the World was written in 1977, and, until very recently, schizophonia resulted from the inability of electroacoustically reproduced sounds to mirror their unmediated originals. In response, available technology was stretched to its limit in the late 20th century to make the reproduced sound exhibit the highest possible fidelity to the original; the result was the development of the domestic hi-fi system. In the 1970s the launch of affordable hi-fi systems brought the visceral impact of Solti's Wagner and Bernstein's Mahler into the home. This reduced the schizophonic tension between live and recorded sound and triggered a classical music boom. That boom lasted for three decades, but in 2001 the arrival of the first iPod started to change the way people listened. Today, the hegemony of digital technologies and mobile audio devices means that headphones and 5.1 surround systems have replaced the unmediated original as the reference sound. So, for new audiences in particular, schizophonia has been inverted. Now there is increasing unease about the disparity between the visceral headphone/5.1 sound and, what is perceived as, the distant and disengaged sound of traditional concert halls. It is this unease, and not dress codes, silence between movements, or any other peripheral convention, that is creating a crucial barrier between classical music and new audiences. Reality is staring us in the face. New technologies have revolutionised the way people listen to recorded music. It is the same technologies that offer the opportunity to beneficially revolutionise the way audiences listen to live classical music. There is a compelling case for using the latest soundshaping technologies to create sonically flexible hi-fi concert halls. Or, to put it another way, let's stop talking about what audiences wear, and, instead, let's start talking about what they hear. * Greek: schizo = split and phone = voice, sound. 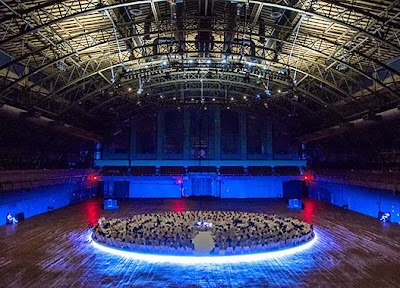 Photo shows hi-fi concert hall created in Park Avenue Armory, New York City for 2013 performance of Stockhausen's Oktophonie. Any copyrighted material is included as "fair use", for the purpose of critical analysis only, and will be removed at the request of copyright owner(s).Also on Facebook and Twitter.